Holme-next-the-Sea01485 532610work VillageThe pretty little village of Holme-next-the-Sea is on the stunning Norfolk Coast Area of Outstanding Natural Beauty. The larger town of Hunstanton is nearby about 3 miles to the south-west. Many of the houses in the village are made from mix of materials including two local stone types – Clunch and Carrstone as well as brick, flint and cobbles. To the north of the village is a relatively thin strip of land between the village and the sea. This includes salt marsh, much used by birds for feeding and breeding. There are a number of protected nature reserves nearby. Holme is the the meeting point of the Peddars Way and the Norfolk Coast Path which together form the national trail. You can follow the coast pathe 3 miles west to Hunstanton or east along the coast to the Burnhams and Holkham, which the Peddars Way extends inland towards Castle Acre. 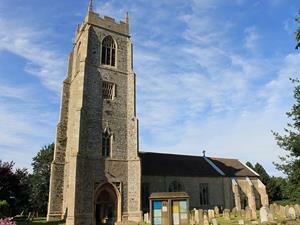 The Parish Church of St Mary was first mentioned in 1188, but the oldest remaining part of the building is the tower which dates from the 15th century. The main church building was demolished and rebuilt in 1888. In the churchyard are the graves of various members of the Nelson family, who lived at Holme House. The pretty little village of Holme-next-the-Sea is on the stunning Norfolk Coast Area of Outstanding Natural Beauty. The larger town of Hunstanton is nearby about 3 miles to the south-west.